We attended the ‘All About Nina’ premiere at the LA Film Festival this past weekend where we spoke with the cast and creators. Check out our exclusive interviews below! ABOUT: Nina Geld (Mary Elizabeth Winstead) is an up-and-coming comedian in New York City. She’s funny, smart and has worked hard to build a career for herself in the male-dominated world of stand-up. 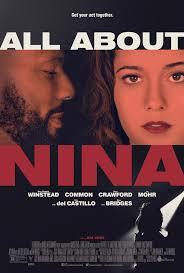 But when it comes to romantic relationships,Nina’s life is a mess. Random guys in bars, abusive married men (Chace Crawford), and an inability to stand up for herself finally convince Nina it’s time for a change. She packs up and moves to Los Angeles, for a once in a lifetime opportunity to audition for Comedy Prime — the end all, be all of late night comedy. After killing it in Los Angeles, she meets chill contractor Rafe Hines (Common), who tempts the brash New Yorker into considering commitment. Sublimating her own desire to self-destruct, Nina has to answer the question, once and for all, of whether women can indeed have it all. The Orchard will release ALL ABOUT NINA in New York and Los Angeles on September 28, 2018!